onsidered one of the best stretches of commercially run river in the world, Batoka Gorge provides one of the most intense sensory thrills imaginable. Its twenty three whitewater rapids and striking scenery deep within the sheer black cliffs afford the adrenaline junkie a wild roller-coaster ride along a route carved over millenia by the Great Zambezi. The rapids are run in large rubber rafts launched from just below the Falls. You can do a half day trip, full day or two day. When the river is high, from March to July, only the last 13 rapids can be attempted. As the water subsides, from June to February, all 23 are navigable. 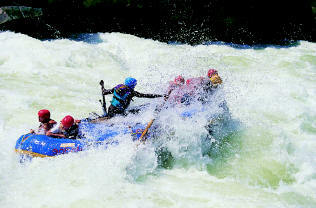 If you are keen for the ultimate thrill then a multi-day trip along the Zambezi is it! After a full day of white water rafting the Zambezi, you’ll set up camp in the Batoka Gorge and listen to the wildlife, gaze into the campfire and down a few cold drinks before you settle in for the night. Rise to a big breakfast, and the crazy adventure starts again! Perfect for a group (4+ persons) travelling together. Overnight camps are on sandy beaches on the River’s edge, deep within the Gorge.